Founded on 1 January 2015, Osloform is a new studio consisting of five young Norwegian designers: Camilla Akersveen, Åsmund Engesland, Christopher Konings, Henrik Waarum and Mikkel Sebastian Juell. All except Waarum are BA and MA graduates of Oslo National Academy of the Arts; Waarum studied as an electronics developer at the University of Oslo. Each has achieved considerable success as an individual designer, but the five decided to form a collective in the hope of bringing Norwegian furniture and products to a wider global audience. All are devotees of materiality, letting the inherent qualities of the substance they are using shine through in the finished object. Produced in cooperation with DOGA, Osloform’s first collection explores the use of Valchromat (wood-fibre panels impregnated with dye and bonded by resin) and brass as materials. Valchromat has rarely been used in small furniture items, despite its suitability. By teaming it with brass, Osloform hope to demonstrate the aesthetic expressions possible with the combination of old and new materials. The first product in this series is Impeller, a limited-edition set of four coasters in different sizes designed for the Nordic Design Fair. The coaster features a geometric pattern in brass laminate, inspired by 1950s/60s aesthetics and the shape of Norwegian hydropower stations. Durable and robust, the coaster is entirely composed of recyclable materials and, because Valchromat is dyed through, it will maintain its colour regardless of nicks or scratches. This edition is produced in small batches by Osloform’s own CNC mill, using brass from a local tinsmith and wood from Oslo Finérfabrikk – making it a 100% Norwegian product. 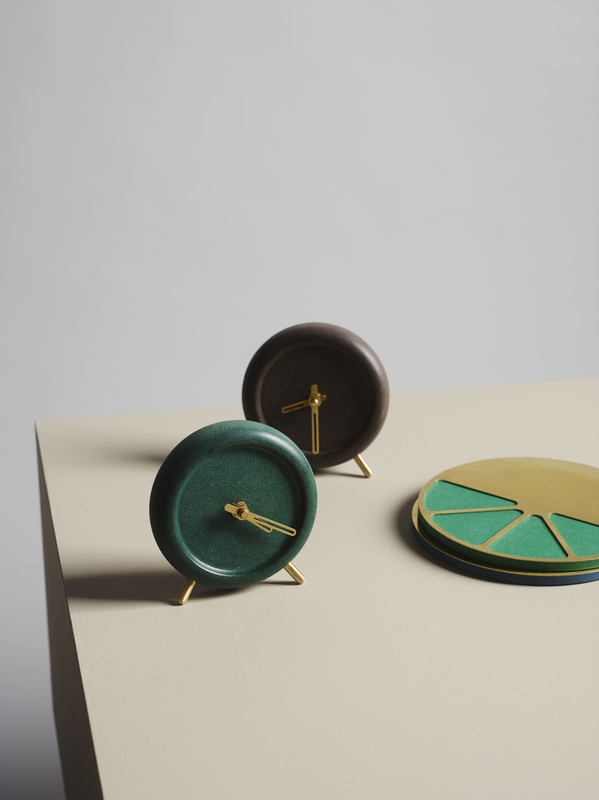 Osloform is also exhibiting Sweep, a silent clock with smoothly sweeping hands inspired by classic Bauhaus wristwatches. It is available as a wall clock and in a table version. Serpentine is a minimalist stereo system intended to be both highly functional in terms of sound quality and aesthetically beautiful as a furniture object.